The company Diana FEA BV is looking for students to model a dike failure using DIANA Finite Element software. This project could be suitable for an internship, additional thesis or master thesis project. As part of the project, there are opportunities to have your participation in a benchmark workshop in Milano(Sept 2019) funded. Together with TU Delft, Rijkswaterstaat is starting a monitoring program along the new sandy banks of the Houtribdijk. During 2 years the waves, currents and sand displacement at the sloping banks of the IJsselmeer and Markermeer will be measured. Vegetated foreshores can strongly reduce wave loads on coastal dikes, meaning these dikes may not have to be built so high. On Wednesday 27 March, Vincent Vuik will be awarded his PhD at TU Delft for his work on this subject. You are all invited to this year’s first Poster Presentation Event of the Hydraulic Engineering department. This is a great opportunity for PhDs and Postdocs to get to know each other, share your work and learn about possible research connections. For Master students this is a good chance to learn a bit on what research is being done in our department, especially if you are interested in pursuing a research career yourself or if you are looking for a graduation topic! Supervisors and other HE-staff are also more than welcome. From the first of February, Bas Hofland has been appointed by the dean as Associate Professor Coastal Structures. Congratulations! 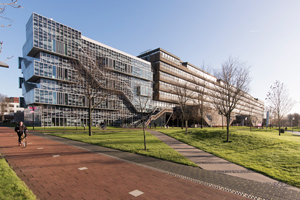 Tjerk Zitman is the new director of studies of Civil Engineering and Kristina Reinders is a new member of the Board of Examiners. Congratulations! The shipping crates that fell from a container ship in the North Sea last week could be a blessing in disguise for oceanographers.